If there was ever a range of fabric, suited to scrappy projects, I think Bittersweet would be high up in the top 10 list. The geometrics work beautifully with the florals and the colours are all so vibrant... and just happy. The Churn Dash block is one of my favourites. It's traditional, but can be jazzed up with modern fabrics for a contemporary look. 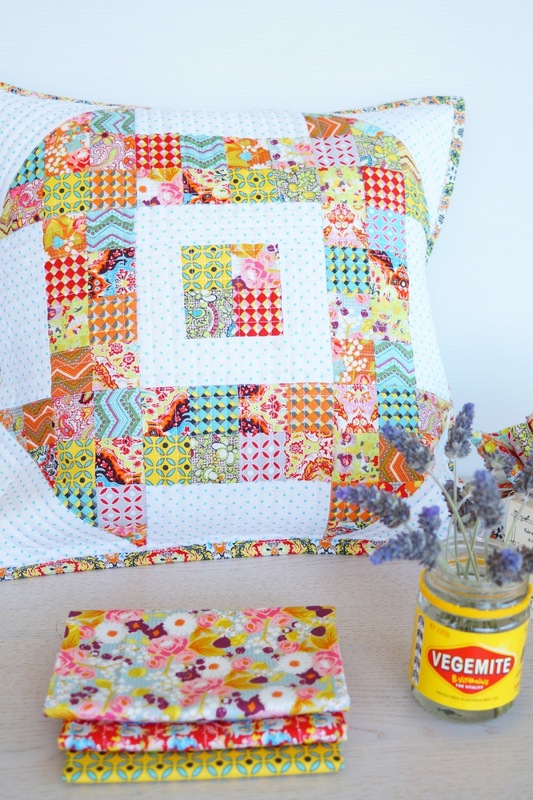 I thought I'd take another step sideways, and create a large scrappy churn block to use for a pillow. 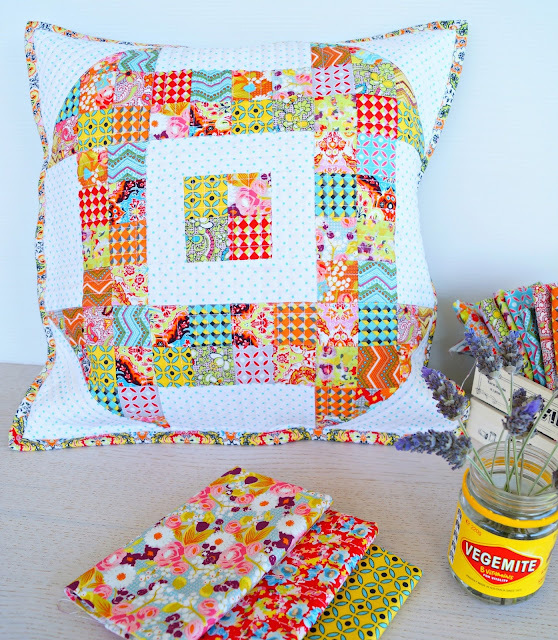 If you'd like to create a scrappy churn dash pillow like this one, I'm including the cutting guide below. My pillow finished up at 15" square, but if you'd like it a little larger, just add a border to suit your cushion insert. To make my pillow, I first sewed 4 squares together, followed by the borders (centre of the block). 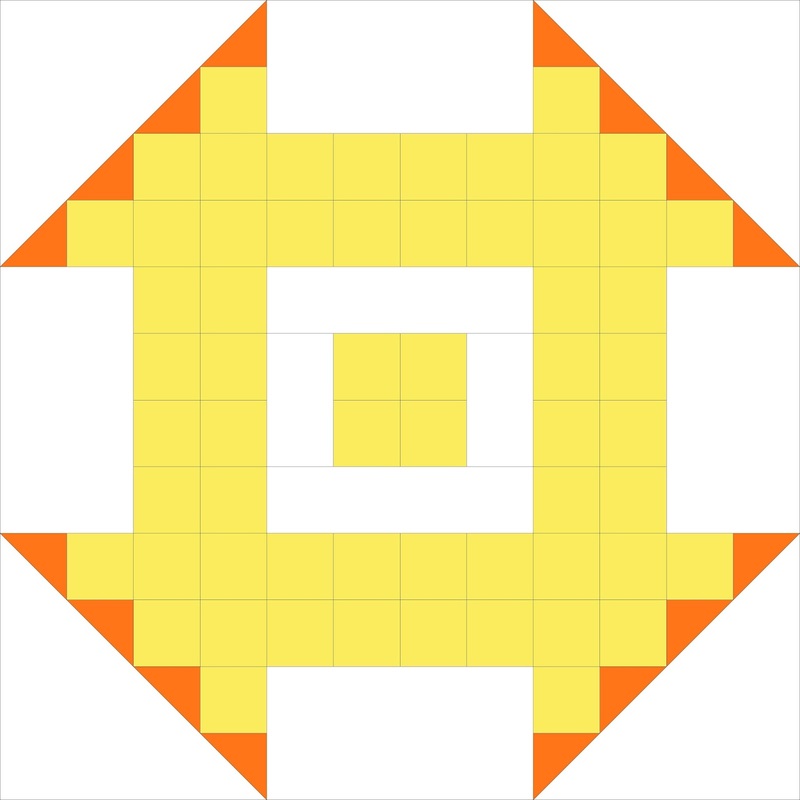 I then paired up squares to create the 4 sides (yellow squares in the image above). 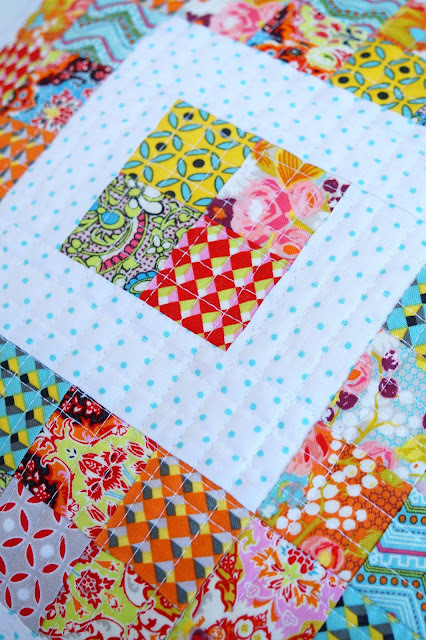 Then sew on the (4) white dot rectangles. Press and trim any excess. 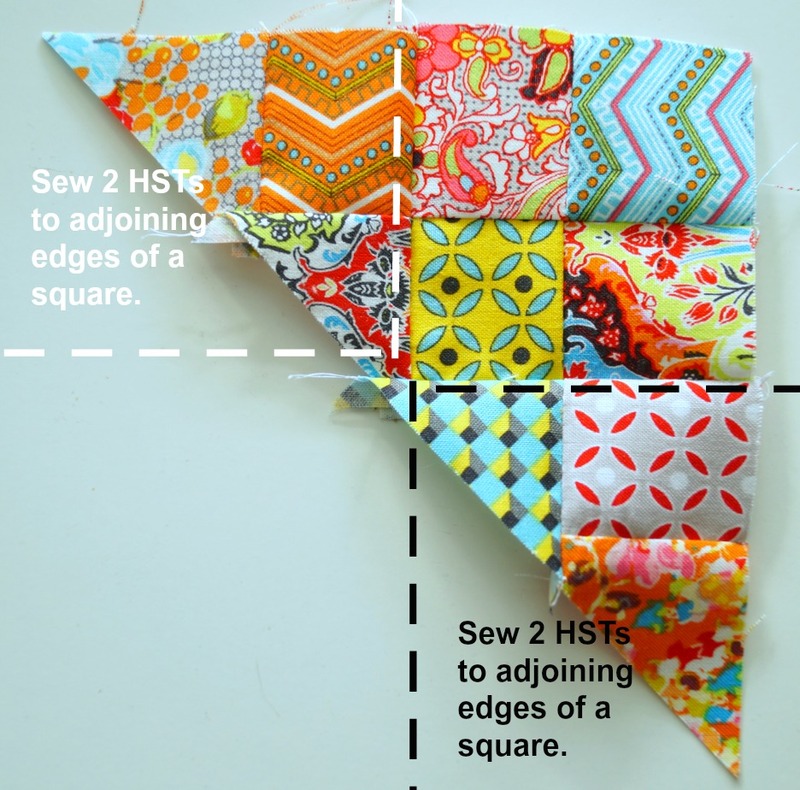 I then sewed together the scrappy triangles (image below). The little HSTs are the orange triangles in the image above. Once the scrappy triangles are created and pressed, sew the (4) white dot larger HSTs to create squares. Press and trim if necessary. Once all of the components are ready, sew the churn dash together. It really does come together quickly, and is a fun way to use up fabric scraps. I quilted the top of my pillow, but adding 2 layers of cotton batting underneath the pillow top. I didn't use any backing fabric because it will be hidden away inside of the pillow. I used my presser foot to sew straight echoed lines along the seam lines. Finish the pillow as desired. I made this pillow with a zipper back and then sewed a binding all the way around to add more colour. As always, please let me know if you make a Scrappy Churn Pillow with this pattern. 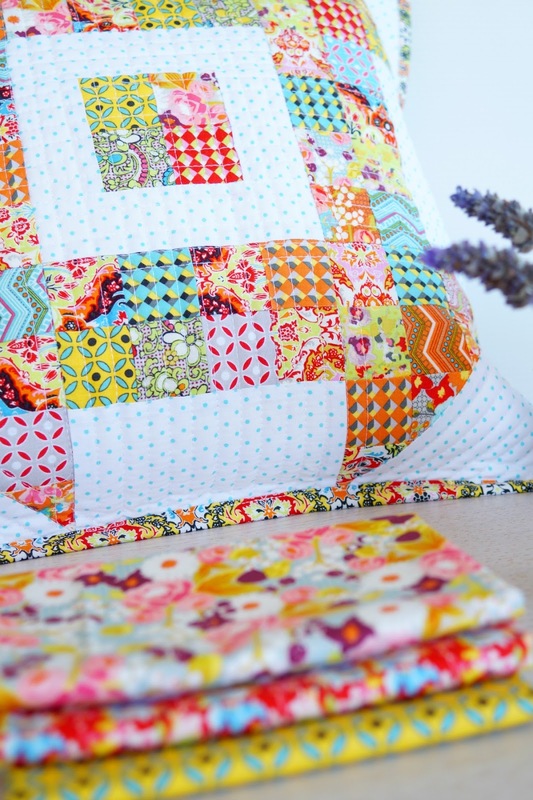 Love this bright and beautiful pillow! Showcases the fabric very nicely! Love this, thanks for sharing ! This pillow is super cute!! It's a stash buster in my book. Thanks.